Kittens are full of energy and love exploring their new home and getting into all sorts of mischief. 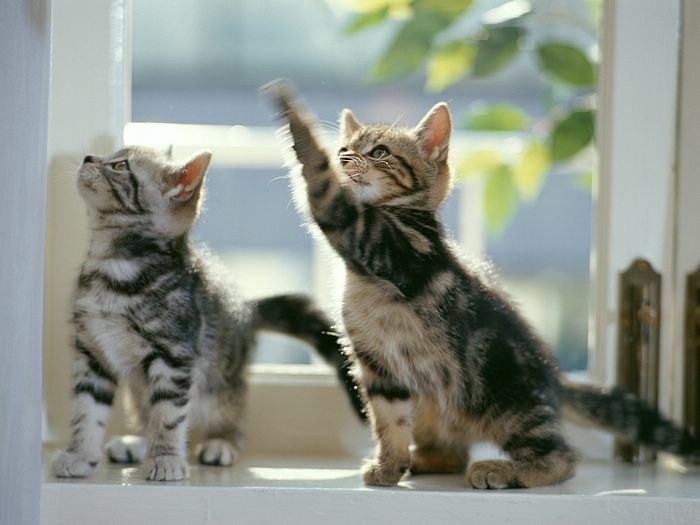 But play time is not just for fun, it can also be quite beneficial to your kitten's health. It is a great way to exercise your growing bundle of fur while also teaching it how to play without scratching or biting. Toys on strings with feathers and fluffy bits and pieces will bring out your kittens instinct to stalk, capture and pounce. These games are not only LOADS of fun for your kitten but it's also a great laugh watching the little ones pounce around. Kittens also love playing catch or kitty soccer where you pass a ball to them and they kick it around. It's a very cute game that not only gets you involved but also has them running around the house. At as young as three weeks old your kitty will start to wrestle and romp around with his or her littermates. These fun little wrestling sessions are vital for your kitten to learn how to interact with other cats. If they get bitten too hard they'll remember not to bite too hard too. Believe it or not, if you train your kitten from a very young age to walk on a leash, it is completely possible to take your kitten on daily walks. You will first need to get him or her used to wearing a collar and then add a leash. Some cats prefer a harness to a collar and it is also much easier to control your cat on a harness. Once you have them adjusted to wearing these, walk them around the house for a few minutes, increasing the walking time a little each day. Then take your cat outdoors, perhaps to your backyard and slowly start increasing the area in which you take them. Remember to be patient, as this could take months. The best games for your kitten to play will require other kittens! It's as simple as chasing one another through the house, hiding, stalking and generally interacting with one another. If you do not have any playmates in your house, consider play dates with friends that have cats. It's great fun and will also enrich your cats social skills.